Siphonic vs Washdown Toilet. Which Is Better? - Toilet Found! Blog Siphonic vs Washdown Toilet. Which Is Better? When you are unfamiliar with how a toilet works, it is fair you think all toilets flush the same way. But the fact is, they don’t. Not to the Americans and Europeans at least, and they don’t see eye to eye in the way a toilet flushes. Though toilet flushing is no rocket science, it has seen some major changes in recent years. Change that allow toilets to use a lot less water and at a higher efficiency to dispose waste. But one thing hasn’t changed. That is, water is still being used as a medium to clear waste. And that’s because it is still the best and the cheapest means. A toilet flush works by using the force of rushing water to push waste out to the septic system. So it’s a matter of how to recreate this fluid energy with the least amount of water. And manipulate it for the highest efficiency in waste clearing. And all this will not happen without taking a different perspective in toilet design. But whatever design may be, the modern World still uses the 2 most common toilet flushing systems. They are the siphonic and washdown flushing system. Typically, siphonic toilets will have a long and narrow reverse ‘P’ or ‘S’ shape trapway. With one end as the inlet in the bowl, and the other connected to the drain pipe underneath the bowl. This trapway design is intentionally meant to create a siphon. And that’s exactly how a siphonic toilet will work. How Does A Toilet Siphon Works? A flush begins with pulling the lever or pushing a flush button. Then the flush valve opens letting the tank water flows through into the bowl. In the case of a siphonic toilet, typically you will see the water in the bowl rises and then subside rapidly into the bowl outlet. What happen is, the water is flowing out faster from the tank than it tries to exit the bowl. This is usually due to a larger flush valve diameter than the trapway. As water exits through the trapway, it displaces the air inside to form a vacuum. Then when it flows over the kink in the trapway, that’s when the siphon begins. You can tell from the water in the bowl that a siphon action has started when it stops rising and begin to subside rapidly. The siphon, at its optimum state is so strong, heavy solid wastes get sucked out with the water. You may see a swirl with some siphonic toilets, but the working principle is the same. Towards the end of the flush you can hear a gurgling sound, that’s when the vacuum is broken and stop the siphon. The bowl is filled with the remnant water, and the refill in the tank begins. All ready for the next flush. That’s basically how a siphonic toilet works. As you can see, the siphon is central to a siphonic toilet. In the past, before the US Energy Policy Act of 1992 (EPAct) kicks in, siphonic toilets use 3.5 gallons of water per flush. The act regulates water volume for toilet flushing to a maximum of 1.6 gpf (gallon per flush). That’s more than 50% of saving on water for toilet flushing. On a national level, that’s a lot of water we are talking about. So how does a drastic reduction of flush volume can improve the efficiency of a flush toilet? With only 1.6 gallons of water to play with, you just have to do things differently. From the valve opening right down to the trapway design, everything has to change and improve. There’s a whole lot of focus on details with the small water volume in mind. So the coordination of the various toilet parts has to be precise. In particular, the flushing and bowl design need to work on to get more done with much less water. And competition for market shares are also key drivers for greater innovation. The result is a highly efficient flush toilet we see today. This is evident with the host of fancy names given to toilet flush systems. Like Vormax, Double Cyclone, Dual-Max, AquaPiston…etc. Even the bowl and trapway are not spared either. The new toilets will have bowls and trapways fully glazed for smoother water flow and to prevent stains. And you may have heard of EverClean Surface or the CeFIONtect Finish. They are propreitary glazes developed by American Standard and TOTO respectively. They are a class above the conventional glaze. So, if you are still using the old 3.5 gpf toilet, this is the time for a change. And it won’t cost you an arm or a leg to make that switch. You get better performing toilet that save water and money. It’s easy to identify a siphonic flush toilet. From the appearance, the S-shape trapway is clearly visible. But if the toilet is a skirted or concealed trapway design, you can look at the water level in the bowl. Which typically is high above the bowl outlet and measure about 9″ x 8″ in surface area. This water in the bowl is to seal off the noxious gases in the sewer pipe. Also to minimize waste from sticking to the bowl surface. The water surface area of a siphonic toilet is usually more than twice the size of the washdown model. Speaking of bowl streaking, some toilet models will have a special surface finish. Such as the SanaGloss (or CeFIONtect) glaze from TOTO and American Standard’s EverClean Surface. They are designed to counter such problem. And with the fully glazed trapway walls, it helps with smoother flow and prevent clogs. Siphonic toilets are prone to clog because of its narrow and winding trapway. Despite that, they are the power flush toilets that are preferred by most Americans. Washdown toilets, or European toilets are seldom seen in American homes. You will understand why as you read further. The way it works is simple. It uses the weight and gravitational flow of water from the tank to flush-out waste from the toilet bowl. It can’t create the siphon action. In another words, wastes are push out by sheer pressure of the water gushing out from the tank. Its short and wide trapway allows waste and water to exit the bowl easily. The trapway diameter of a washdown toilet is easily twice the size of the siphonic model. Usually around 4 inches wide and much shorter. And due to its short trapway the water level in the bowl is low, resulting in smaller surface area. And because the trapway is short and wide, the washdown toilets are relatively clog free. Most of the washdown toilets come with push button dual flushing system. It has 2 flushing capacity, a full flush and a half or partial flush. The half flush is usually 1.0 gpf or lower and useful when you only need to clear liquid waste. The full flush is of course meant for removing solid waste. Washdown toilets may have the advantage of being clog free, they are not great at bowl cleansing. And bowl streaking is a problem because of the small water spot, which causes skid marks to form easily. Odor is also a problem with the washdown toilet especially on heavy load. As the wastes are not fully submerged in water, smell can quickly fill the air. So your toilet needs to be well ventilated and having an exhaust fan is a good way to keep the toilet fresh. Another shortcoming is the need to flush twice on a heavy session. Not that it can’t clear solid waste efficiently, it’s the waste smears on the bowl surface. Often you will need a second or third flush to get a clean bowl. They are shorter in length (front to back) obviously. 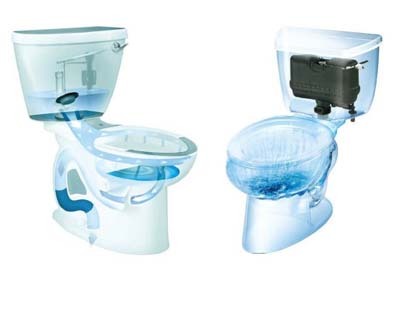 The modern washdown toilet uses push-button flush instead of trip lever, and they are usually dual flush. But that’s not necessary always the case. There are models which are still using the trip lever, even for dual flush toilets. The trapway is designed to be wide and short so waste can easily get push over the weir and straight into the drain pipe. And because of this, the water level is just at the brim of the bowl outlet. Hence, the water surface area is just as big as the bowl outlet (typically about 4″ x 5″). Regardless of toilet types and design varieties, this are the 2 toilet flushing systems the world is using. Both has its merits and flaws, you will need to weight them out and decide which one can best serve your needs. End of the day, it all voice down to personal preference. Especially for a toilet, you can’t get more personal than that. As I mentioned earlier, due to the low water consumption, our sewers clog and dull much more often than before. Many sewage pipes date back to the 70s or 80s, they are initially designed for a much larger amount of wastewater. In addition, many wastewater treatment plants are underutilized, which significantly reduces the effectiveness and increases the maintenance costs. This leads to rising water prices, the less water is consumed, the higher the price of one cubic meter of fresh water and sewage gets. This is due to the fixed costs for water production and wastewater treatment. The biggest factor for the low water consumption are the high costs for water and for wastewater (wastewater is more expensive in Germany than fresh water). In Cologne, we pay about 3.33 € (1.64 € fresh water and 1.68 € wastewater) for one cubic meter of water. In Berlin, however, it is € 5.12 (€ 2.24 fresh water and € 2.88 wastewater). In contrast, you pay in Detroit about 1.57 € for a cubic meter of water and sewage (plus the basic costs). Another reason is the development of water-saving washing machines and dishwashers. In the 1980s, these devices were still among the largest consumers of water, currently both devices consume only about 18% of total water consumption. Here there are actually legal regulations, so current devices may only have a certain maximum water and electricity consumption, so that they may be sold in Europe. As a kiwi with US relatives I visit a lot and hate US bumsplasher toilets. The ones in public lavs (dont get me started on the lame euphemism “bathroom” – It’a the toilet/dunny/bog/lav. There is no f..king bath in there) are worse as the water trap is at testicle level. The number of these hideous contraptions I have seen blocked defies counting. Just another bit of yank Exceptionalist nonsense. Ha, I’ve always wondered why people call it a bathroom when it doesn’t even have a bath in it. Or even a shower for that matter. It’s just the toilet for me. It’s not the toilet, Andrew, it’s you. Your turds are too big and your balls are too saggy. 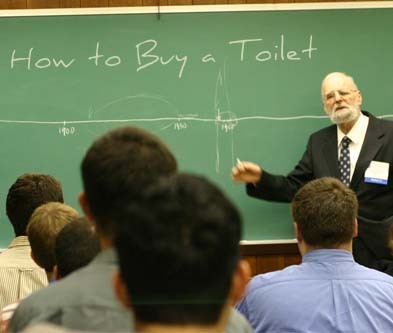 As for your “bathroom” persnicketiness – the toilet is the fixture, not the room, a dunny is a cellar, a bog is a swamp, and a lav doesn’t always have a toilet in it. Oh, and I may as well also mention that a kiwi is a bird and a fruit, but not a person. You’re better off with the classic observation that Americans park on driveways and drive on parkways. I have made the exact opposite experience with never 1.6 GPF symphonic Toilets in the US while I was on holiday at the east coast. Many of the new 1.6 GPF toilets were not able to wash out the entire contents with a single flush, sometimes it needed more than two flushes. Some of these toilets even had problems with non solid waste or a single sheet of toilet paper. Only toilets with high tank or flushometer were more reliable. In contrast, my Keramag Allia Paris toilet with 6 liters or 1.6 GPF flushes even larger loads down. It is very rare that I have to rinse several times. Skid Marks are indeed a problem, but they can also be avoided. Newer toilets here in Europe have a special surface coating which makes it easy to remove soiling with a single flush. Hi Andy. Thanks for sharing your experience. I’ve been to europe a couple times and never understood why it seemed like their toilets used huge amounts of water. Now i know why. But this article never mentions the volume of water differences for each design? European toilets waste a lot of water and those types of toilets would never work in drought prone areas. Regardless of design, the maximum water use for toilet flushing is 1.6 GPF in the United States. Europe will have a different rule on water usage for toilet flushing. So all toilets, including the washdowns, that are sold in the US will have to meet the maximum 1.6 GPF. However, in states like California, Colorado, Georgia and Texas only 1.28 GPF max. are allowed to be sold. It is not correct that German toilets consume more water than American toilets. In fact, newer German toilets uses only 6 liters (1,6 GPF) of water. Most cisterns also have a button for a 3-liter (0,8 GPF) economy purge, which is sufficient for smaller dumps due to the low water level in the bowl. In Germany, only cisterns are available which have a maximum capacity of 9 liters, but the default manufacturer setting is 6 liters. Some newer rimless-free toilets only work with 6 liters, with 9 liters they will overflow. It was quite a while ago when there were still cisterns to buy with 12 liters. There was an 12 liter cistern in my actual home (Build 1980), but i replaced it with an Vigour cistern (HE-CLIVSP). It is even an advantage of the European wash-down toilets that they flush very well even with little amount of water. In contrast, some of the older US toilets had to be completely redeveloped with the introduction of the Energy Police Act. Some manufacturers needed years to adapt the toilets to the new volume of water. Until then, clogged toilets and incomplete flushing were common. Moreover, there is no legal regulation in Germany how much water the toilet is allowed to use. We do not need something like that, because water consumption is very low even without legal regulation. Due to the sharp decline in water consumption in Germany in recent decades, we have quite different problems to solve. P.S. : Yes, my Allia Paris WC has an 4-inch (100mm) trap/drain pipe, it is even impossible to clog it during normal use, maybe if you try to wash down a turkey ;). In fact, 4.85 liters (1.28 gal) and 3.8 liters (1.0 gal) are becoming more and more common in the US right now. All the top manufacturers like American Standard, TOTO, and Kohler have rolled out the 3.8 liters recently, and they are siphonic models predominantly. Water saving is much more complicated with symphonic toilets, the price and the susceptibility of the toilets to blockages and defects increases. If a symphonic toilet is clogged, it is not always easy to get rid of it again. In wash-down toilets, it is almost always solved by bare hand (using a glove, of course). In Germany, a person consumed an average of 121 liters of water per day in 2013 (with a downward trend), of which about 27 percent or 33 liters is used for toilet flushing. In the US, on the other hand, a person consumes an average of 327 liters (or 86.5 gallons) of water per day, of which about 24 percent or 78 liters is used for the toilet flush. In 2015, according to preliminary data, there are still 325 liters (or 86 gallons) consumed per person per day (domestic self and puplic-supplied per capita per day use in the US). Despite all efforts and legal regulations, American symphonic toilets still consume many times more than German wash-down toilets. And this, although there is no legal regulation in Germany how much water a toilet may consume. In recent decades, our water consumption has fallen so much that we now have completely different problems, so our wastewater treatment plants are underutilized and our sewage pipes clog. The fact that some European countries have a higher water consumption than Germany is not due to the toilets (they are the same type everywhere in Europe), it has other reasons (for example garden irrigation and swimming pools in the southern countries). A problem in the US is simply that many people flushes the newer water-saving toilets several times or directly install a larger water tank. I was allowed to experience this myself during my trip around the west coast. Due to the sometimes poor flushing performance of the newer toilets, there is indeed a demand in the US for old “vintage” toilets that have a more powerful flush. Therefore, I do not think that the toilets in the US reach the low water consumption of German or European toilets, even in the long term. Of course, there are some bad examples of wash-down toilets, and not every combination of toilet and cistern works well, but this is the same problem with symphonic toilets (or even worse). There are certainly pros and cons between the modern symphonic and wash-down toilets, and of course there are some bad examples on both sides. but for sure, wash-down toilets will usually not consume more water than symphonic toilets. Everything else is, as the current president likes to say, fake news. It’s the same as the myth that there are only shelf toilets in Germany (The one, where the waste is collected on a pedestal for better inspection afterwards). I have not seen such a toilet for years, and I’m very pleased about that. The only clear advantages of symphonic toilets in my eyes is the less an odor, water splashes and skid marks, due to the higher water level. But skid marks and water splashes when using wash-down toilets can be prevented with a bit of practice, so there is no need to flush double. When it comes to noise, I see a draw. There are some wash-down toilets that make virtually no noise. In contrast, some cheaper symphonic toilets are extremely loud especially at the end of the flushing. Wow! how is that even possible? What causes the fall?